I try to read every new bigfoot book. I may have missed a few, but of all the new Bigfoot books I've read in 2012, Visitors In The Twilight by Lori and Jeff Chandler was my definite favorite. Mind you, it's not a book for everyone. If you are a dyed-in-the-wool advocate of the position that Bigfoot is an undiscovered wood ape, you should definitely avoid this book. If, on the other hand, you are open to the idea of sasquatches being habituated to certain humans, this book is a definite case history to support that possibility. If you are troubled by the idea that the sasquatch phenomenon may be somehow related to other 'paranormal' phenomena, especially extraterrestrials, you will hate this book. Frankly, the fact that co-authors Lori and Dustin Chandler courageously took on that issue is one reason why I found Visitors in the Twilight to be so unique and interesting. It's also a very unpretentious work. The authors self-published the hundred page document without the benefit of offset printing. The format is 8 1/2 by 11" and the cover art is colored-pencil. 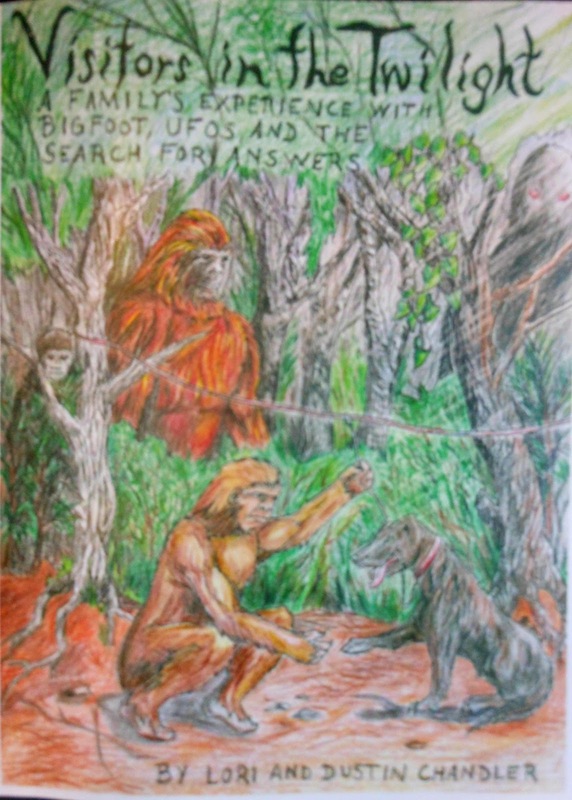 In this respect, the Chandler's contribution to bigfoot literature is very similar to Jan Carter and Mary Green's Fifty Years With Bigfoot (2003) It has the same down-to-earth, no-frills style. There are typos, the writing style is unpolished, and the photos are poor quality. For this reason, many will find fault with Visitors just as they did with Fifty Years when it was released. In my view, the salt-of-the earth tone of this mew book speaks to the authenticity of their rural roots and their determination to get their fascinating story into print, despite a lack of support from any professional book publisher. More than anything else, this is what I like about Visitors: it is courageous, sincere, and exactly what I have learned to expect from the genuine situations where a group of sasquatches have become habituated to a rural family. I find the upretentious-ness of this book to be endearing. It isn't a great literature work, but I don't think it wasn't meant to be. It's just an accurate and personal description of the sasquatch-related events that found a rural Georgia family that never went looking for bigfoot. Indeed, they weren't even interested in bigfoot before all the weirdness bagan to happen right around their own home. And I for one, am grateful of the fact that they went to the time and trouble to write it all down. I'm also grateful to Molly Lebherz of San Diego for steering me toward the Chandlers book. Two events loom large in this upcoming month that may bode well for the sale of bigfoot-related literature. First, of course, is Christmas: a good time to buy a bigfoot book for that cryptozoology devotee on your list. Also, it appears that Christmas is about to come early for us bigfoot devotees. We are about to see publication of the much anticipated Bigfoot DNA study by Dr. Melba Ketchum et al. Internet chatter is already sky high. A pre-publication press release has already appeared. Ketchum has promised an official announcement in a matter of days. No word yet on what scientific journal will be publishing the landmark 5-year study, but I'm keeping my eye on the American Journal of Human Genetics. Most journals publish at the beginning of the month, which is a only week away, so keep your eyes open this week for the big announcement. 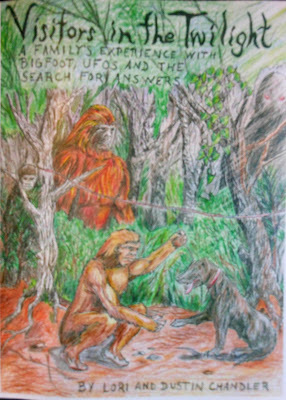 One would expect that, with a lot of new interest in the Bigfoot subject, that should mean a big interest in books on the subject. May I then, recommend two very different but very interesting new books on this subject: Visitors in the Twilight by Lori and Dustin Chandler, and Shady Neighbors, by yours truly, Thom Powell. Please read and help me promote my new blog. I think you and others may find it quite mind boggling and inspirational. Please checkout my new blog!